The port of Hodeida, under the control of Shiite rebels, known as Houthis, is vital lifeline for most of Yemen's population, which depends on the port for food and medicine. Footage obtained by The Associated Press shows firefighters trying to extinguish the fire which sent clouds of heavy black smoke into the sky. It was not immediately clear how many facilities were damaged by the fire or what caused it. 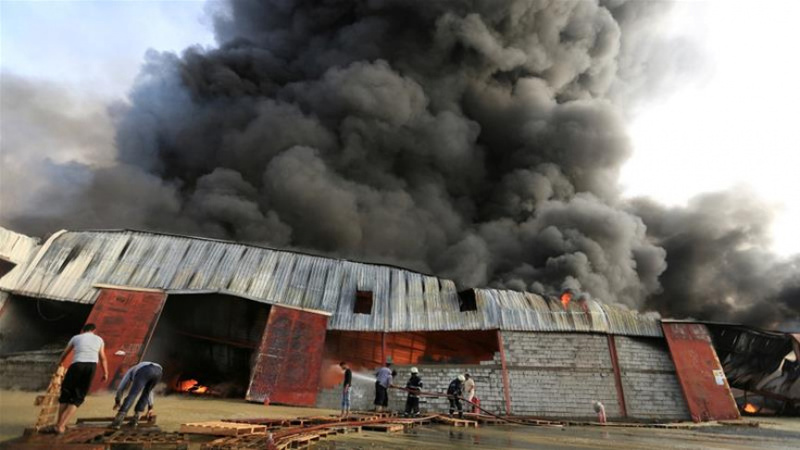 "We have contained the fire and tried to not let it expand to other facilities as the area includes factories, companies and storage facilities belonging to businessmen and other organizations," Abdul-Rahman al-Faqih, public relations director of the civil defense Hodeida branch, said. "It (the fire) may have been caused due to negligence." Mohammed Ghalleb, a guard for a storage house in the area, said he saw some light smoke at around dawn but initially thought it was caused due to waste burning. "Had the fire been controlled from the beginning, it wouldn't have reached this extent," he said. Yemen has been embroiled in a civil war pitting a Saudi-led coalition backing an internationally recognized government against the Iran-backed Houthis since March 2015. The coalition aims to restore the government of self-exiled President Abed Rabbo Mansour Hadi to power. The three-year stalemated war has damaged Yemen's infrastructure, crippled its health system and pushed it to the brink of famine. The country is now the world's worst humanitarian crisis, with more than 22.2 million people in need of assistance. Malnutrition, cholera and other diseases have killed or sickened thousands of civilians over the years.